Robin Gareus announced the first public version of meters.lv2 — a bundle of LV2 plugins for audio level meering and advanced sound analysis. And we are giving away a book to help you learn using them. Meters.lv2 features 10 basic needle style meters — DIN, Nordic, EBU, BBC, and VU — both mono and stereo variants. You are probably already familiar with their vertical versions that are part of Ardour since v3.3. Maximum True Peak Level: the maximum value of the audio signal waveform of a programme in the continuous time domain. There are a few more meters in the bundle: a stereo phase correlation meter and a digital true-peak meter (4x oversampling). If you want to learn using audio level meters properly, there's a great book — "Audio Metering. Measurements, Standards, Practice" book by Eddy Brixen. We are giving away one hard copy of it. Post in comments below, what combination of DAW and audio interface you have, and we'll randomly pick a winner on Sunday. Submissions close on October 13, 5pm UTC. You can grab meters.lv2 source code on GitHub. Binary builds expected to hit repositories for Linux distributions soon enough. LV2 1.0 released, what's next? 18 Responses. Comments closed for this entry. The EBU r128 interface is not unorthodox at all. It was pretty much lifted from http://www.tcelectronic.com/radar-meter-bundle-tdm/ (the histogram view is new, but also not novell). All of the plugins do have a corresponding hardware equivalent which not only looks similar but behaves identically. e.g. the DK-Tech goniometer. Oh, and I’m using Ardour (git version) of course; mostly with a PreSonus Audiobox 1818VSL. Robin, this work really excels! Thank you very much! This looks great and contains a greater number of metering standards than I was aware existed. Still at the early stages in my experimentation with audio recording, I use Ardour 3.3 with a simple E-MU 0204 USB audio interface. It was the cheapest thing that allowed me to hook up the Sennheiser MD421N microphone I’ve inherited from my father. Yet meters.lv2 features all the meter-types that are commonly used by various broadcast industries today and have been properly standardized/documented. That being said, they’re also only really relevant if you work for the broadcast industry, although they certainly can come in handy for any audio production. Anyway, meters.lv2 would not be what it is without the various contributions from Fons Adriaensen, David Robillard, Chris Goddard and Axel Müller. Good metering can also mean the difference between a good, transparent music master and one that is squished to loudness-war craziness. Metering, and understanding metering, are so important! I use ProTools 8 HD, with digidesign 96io hardware. This is a fantastic collection of meters… thanks so much. It’s great to have something that complements and meets the same high standard as jkmeter, which I use all the time! I’m on Harrison MixBus, with my trusty RME Multiface. Great looking meters, phase scope will be a great companion for my use of japa in Live sound. At home I was using fons ebur128 so I celebrate this Radar style skin. 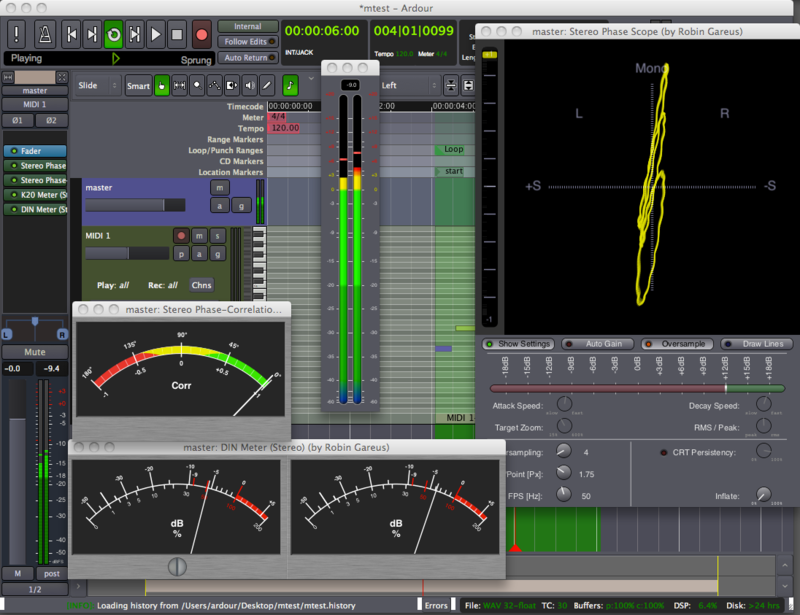 Ardour 3.0 and M-audio Fast Track Ultra here. FWIW, the k-meters are new (yesterday) and neither complete nor officially released (just git-head). They does not yet meet the official standard: a numeric indicator and peak display is missing, but we’ll get there. A fantastic collection of meters! The work you and Fons and others have been doing have really opened up visualizing sound for me. I use Ardour3 with 2 setups - a pair of MAudio Delta 1010s, and an Alesis MultiMix16 Firewire. I’m so happy with the Alesis that I hardly use the Deltas anymore. I use Ardour 3.0 with Focusrite Scarlett 2i2. But I’m thinking an upgrade would be good. Good to see the growing number of lv2 plugins. Those one look pretty great. While it’s unlikely that pro-tools will add support for LV2 anytime soon, I hope you have access to metering tools adequate to the ones explained in the book. While researching for and working on meters.lv2 I came across a variety of VST and AU plugins (even expensive commercial ones) which do not properly implement respective standards. You’ll probably find out… There are are certainly professional meter plugins available. Anyway, since earlier today meters.lv2 runs nicely on OSX, too: It should also work on BSD and Windows, but I have no machines to check.